This week I’m going to outline a few ways the Mets can attack this offseason. To start, I would fire EVERYONE, besides pitching coach, Dave Eiland and the hitting coach, Pat Roessler. It is time to bring in a new regime. Although Sandy Alderson brought this team out of their deep slump as an embarrassing organization and helped put together a World Series team in 2015 his time as GM needs to end. He does not deserve all of the blame, but he is the face of the organization so, fair or not, he gets the blame. The player development has been a joke throughout his tenure, producing almost no talent at all, and the type of team Alderson believes in simply does not work. Alderson believes in high on-base percentage, power, and does not care about speed, defense, or athleticism. Since the announcement that Sandy Alderson will be stepping down as GM, the triumvirate of John Ricco, J.P. Ricciardi, and Omar Minaya has taken over. The Mets will be searching for a new GM at the end of this season with an outside voice likely to be hired for the job. The Mets have suffered more injuries the past few years than some teams have in a whole decade, so whatever they are doing training wise is not working. Mickey Callaway needs to go as well. He simply does not have the chops to manage in New York. He doesn’t seem to believe that cracking down on his players helps, which is something I completely disagree with, and he consistently fails to make the best in-game decisions. The Mets need to bring in a manager with some major league managerial experience that can handle New York pressures as well. As I mentioned earlier, the Mets aren’t far off from competing and with a few smart signings, much like the last offseason, can be contenders again. The team has an above average rotation that may or may not need only one free agent signing to fill it out depending on this year’s trade deadline. The outfield is now filled to the brim with Brandon Nimmo exploding onto the scene and Lagares, Conforto, Bruce, and Cespedes still on the roster for next season. While the final three men on that list have struggled/been injured this season they are still All-Star caliber players that can produce at an above average rate. Next year, those 5 outfielders can make this team an average offensive team by themselves if they do what they have now proven they can do when they are right. The only real hole in the infield is second base with a lot of above-average options available this offseason in free agency. Third base will likely be held by Frazier, Amed Rosario has shown flashes of his full potential this season and will be the everyday shortstop next year unless the Mets shock the world and sign Manny Machado. Dom Smith or Peter Alonso will be at first next season barring something shocking. 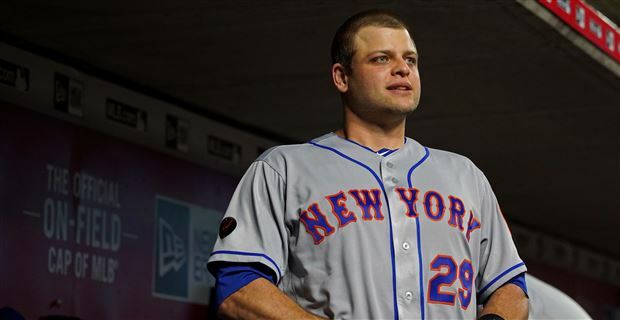 When it comes to catcher the Mets should do whatever it takes to resign Devin Mesoraco, who has been great behind the plate and has been pretty good at the plate as well. There simply are no great catchers available in free agency, so the Mets should resign Mesoraco and roll with him and Plawecki next season. The bench and bullpen need to be revamped, yet again. The biggest flaw of Alderson’s tenure, in my opinion, has been his inability to sign solid bench players that can produce off the bench and competently start if needed and he has not signed the right relievers. The Mets bench is essentially halfway full if Lagares is still on the team next year as he, Plawecki, and one other outfielder will be on the bench to start the season. That means the Mets need to sign two guys that can handle the corner infield positions and/or the middle infield positions. Bruce and Plawecki can handle first base adequately, so that could affect how the Mets fill out their bench. The bullpen is mostly open as Gsellman, Lugo, and Swarzak are the only guys that are locks for the pen next season. Although Lugo would like to start it is apparent that he is much more effective as a reliever. Those three will likely handle the late innings, but they need to sign some veterans to fill out 3 of the 4 remaining spots leaving one spot up to the boatload of relievers the Mets have at AAA right now. Now that I have outlined the holes that the Mets will have to fill this offseason I will show you three directions the Mets can go in to fill their Major League roster for next season, which they hope will compete for a playoff spot. The first option is an expensive one that is likely to scare away the low spending Wilpon family, but looking for the best deals the past few offseasons has not worked. Trying to save pennies on the dollar by signing Swarzak and Vargas instead of signing guys that are a bit more accomplished/younger. This is the approach that I would like the Mets to use for multiple reasons, the first being that they are in the biggest market in America, it is time to stop acting like the Oakland Athletics and be more like the Red Sox and Yankees. The offseason signings: Manny Machado- 3yr/115mill, DJ LeMehieu- 3yr/39mill, Jeurys Familia- 3yr/30mill, Devin Mesoraco-2yr/10mill, and Justin Wilson 3 yr/27mill. ∗∗75 million added to next seasons payroll. With players hitting free agency/getting raises through arbitration the Mets payroll will be around 140 million before anyone is signed as a free agent. Adding 75 million to the payroll will lead to the Mets payroll starting around 215 million which is 9 million dollars over the tax threshold, meaning the Mets will have to pay a 20% tax on the overages. In the grand scheme of things that tax money is not all that much and the Mets will be able to reset it the following season with Frazier and Swarzak coming off the books and Wrights contract dropping to 12 million dollars. Those 5 signings will fill out the Major League roster and push some guys to the bench or the minors. If you are surprised to see Machado and LeMehieu on that list let me explain to you how they, along with the three others, will affect the Major League Roster. Starting Rotation: deGrom, Syndergaard, Matz, Wheeler, Oswalt. Bullpen: Familia, Gsellman, Lugo, Wilson, Swarzak, Vargas, Sewald and others. The offseason signings affect the infield the most. (I have a feeling that Flores will be traded before the deadline this year and if he isn’t, in this scenario, with these signings TJ Rivera or Peter Alonso will be in the minors). 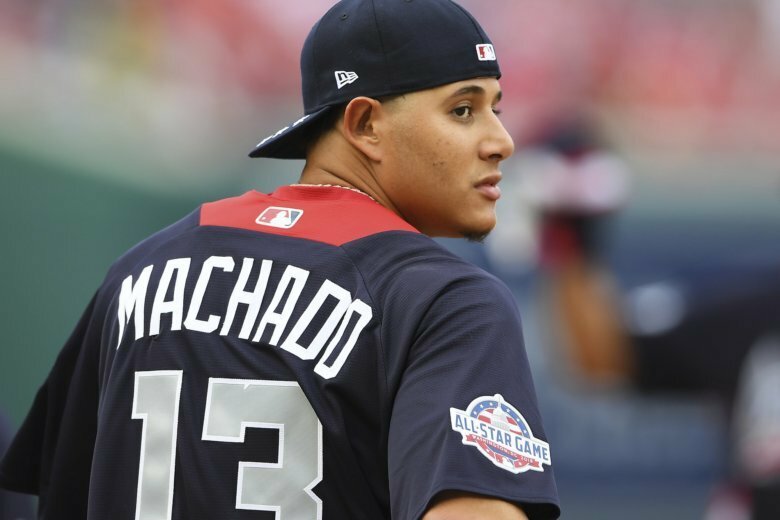 The acquisition of LeMehieu and Machado pushes Frazier to the bench and makes the teams infield defense elite while drastically improving the offense. In this situation, Frazier would split time at first with Bruce, and Flores or Alonso while being the primary backup at third base. Machado would have to be open to returning to the hot corner while essentially backing up Rosario at short when he needs a day off. In the Outfield, while Conforto, Nimmo, and Cespedes top the depth chart, I would not expect any of them to start more than 130 games. My proposition is to have a 4-man rotation between those 3 and Bruce that essentially be starting 3 games, then have a day off. That consistently happening throughout the season would lead to 121 starts each. Obviously, it is not that simple even if they all stay healthy because Lagares needs to start occasionally, especially against lefties which is a weakness for the Mets with Bruce, Conforto, and Nimmo being left-handed. These situations generally work themselves out in some way or another, Lagares could be traded, Cespedes could (and probably will) have major surgery on his heels, which will likely keep him out until June and anyone else could get hurt along the way. Nonetheless, in this scenario, the Mets would have a legitimately scary lineup with 5-6 all-star caliber players in there every day and an elite infield defense with two gold glovers in Machado and LeMehieu and a possible future gold glover in Rosario there too. Frazier, Flores, and Bruce are all average defenders at first base. Not only will the starters be good the Mets will have 5 bench players that could start on almost any other team in baseball, but they will be able to stay fresh by starting 1-3 times per week and pinch-hitting whenever they don’t. The starting rotation will stay the same with Oswalt taking Vargas’ spot and this will once again be the team’s strong spot. The bullpen will essentially only have one new face as Familia will be brought back after his 2 1/2 months with Oakland, however, one very good arm might be all they need to add. Gsellman and Lugo have proven that they can handle high leverage situations and pitch multiple innings in relief. Justin Wilson will be used as a late-inning reliever and as a lefty specialist. Jason Vargas, a career starter will hold a role similar to that of Lugo this season but also having a lefty specialist role. The Mets shouldn’t have signed him, but they have him for next season and this role allows him to be useful to the team where they need him most. The back 4 relievers will be Familia, Gsellman, Lugo, and Wilson. However, they will be able to use Gsellman, Lugo, and Wilson at any point in the game if it helps the team win. Swarzak and Vargas will be middle relievers, but as I said earlier Vargas could be a specialist or eat up 3-4 innings. the 7th spot in the bullpen will be rotated between Sewald, Peterson, Bashlor, and others as it was this season. This team would EASILY be the best in the division and barring any major injuries would win 95-100 games. As solid a team this would be, it is unlikely to happen. It will be hard to get Machado to even consider the Mets if the Yankees come calling and well, the Wilpons are the cheapest New York owners of any sport. This move would cost the Mets a lot of money, but notice everything will come off the books in 3 seasons, at that point the Mets will not have Cespedes, Frazier, Bruce, Swarzak, Vargas, or anyone they would sign in this scenario under contract, meaning they could go into a rebuild, hope their lower-level prospects pan out, or resign some of these guys. The offseason signings: Manny Machado- 3yr/115mill, Jeurys Familia- 3yr/30mill, Devin Mesoraco-2yr/10mill, and Justin Wilson 3 yr/27mill. ∗∗ 62 Million added to next seasons payroll, making the overall payroll just about 202 million. That would keep the Mets under the luxury tax threshold while still spending like a big market team. This option is very similar to that of the most expensive one, but without LeMehieu it brings a different dynamic to the offense. Let’s take a look at how the roster will look for the Mets next season barring any injuries or trades. Starting Rotation: deGrom, Syndergaard, Matz, Wheeler, Oswalt. Bullpen: Familia, Gsellman, Lugo, Wilson, Swarzak, Vargas, Sewald and others rotating out for this seventh spot. In this situation, the pitching stays the same but it keeps Frazier as an everyday starter with Machado playing third on days that he needs off with Rosario sliding back to short. The offense is still much improved with Machado on the team, but it forces Rosario to learn a new position and the bench is not as strong. I don’t think any fan would complain if the Mets went in this direction because they would have added a star in Machado, brought back an elite reliever and signed a new one. The Mets will still have to figure out first and rotate in the outfield, but this can be a potent lineup with improved defense up the middle. If the Wilpons want to win they have to at least bring in Machado and top of the line relievers like Familia and Wilson. If the Mets go in a direction similar to this one, they don’t have a shot at competing. The offseason signings: DJ LeMehieu- 3yr/39mill, Jeurys Familia- 3yr/30mill, Devin Mesoraco-2yr/10mill, and Justin Wilson 3 yr/27mill. ∗∗ 37 million added to the payroll, making the overall payroll 177 million dollars. In this situation, the Mets sign the smooth-fielding LeMehieu as their headliner. His glove next to Rosario would be the best middle infield tandem the team has had in more than a decade. They would still put their bullpen in a situation where it can be one of the best in baseball, and spent more than they have in a while compared to the rest of the league. At the end of the day though, unless Cespedes, Frazier, and Bruce stay healthy this teams offense won’t be good enough. LeMehieu is a solid hitter, similar to Daniel Murphy when he was in a Mets uniform. He hits for contact, not for power and doesn’t strike out much. If the Mets can’t get Machado, LeMehieu needs to be the guy they sign, but they can’t survive on offense without a resurgent season from Bruce, Conforto, Cespedes, and Frazier. Rosario will probably take a step forward, as will Nimmo, but the team will need health. The pitching again will be the strength, but the infield defense will be above average. This team would be very similar to that of the one constructed this past year with a deeper bullpen. With health, the playoffs are a legitimate possibility. Without it, there is no shot. The Wilpons need to open their pockets. If they do the fans will show up, if they don’t the season will be lost by June. Time will tell which direction the Mets go in, but if I had to guess the owners will cheap out like they have the past 8 years. Hopefully, they fire the front office and Mickey Callaway to start the offseason off correctly. If they do the correct course of action can be taken, if not it can’t. Written by: John Newell on July 23, 2018.